Early Bird Registration is Here Now With Lower Two-Camp Cost than Last Year! TRAIN WITH THE NATIONALLY RANKED BELLEVUE COLLEGE TEAM AND COACHING STAFF! Registration for summer baseball camps are ongoing. All camps are usually full by June. Applicants are encouraged to register before the school year ends. Why Bellevue College Baseball Camps when there are so many out there? Cost and Quality. Our coaching staff that directs one of the most successful college programs in the nation (ranked in the top 40 nationally multiple years) directs youth instruction with the same attentive detail as they do with the collegiate players…the same coach who have led a program to a winning season for the past 30 years…the same coach who led Bellevue to the conference championship title in ’07, ’09, ’11. Coach Mark Yoshino has been organizing the youth instruction for 26 years. We encourage you to speak with ANYONE who has attended our camps in the past to verify this commitment. It is our attempt to offer the best combination of instruction and fun in a quality environment. Our facilities and location are ideal for the entire eastside community. Featuring one of the top outdoor natural grass fields in the state, the facility is second to none. Our offerings have benefited thousands of young ball players for the past twenty five years, as BC’s baseball camps have served the eastside community longer than any other organization. And finally, the cost. Bellevue College baseball camps are one of the most cost-efficient camps when compared to all other camps in the entire region – you are encouraged to compare. Most specialty FULL day camps, whether it be sports or technology-related, are well over $350. Bellevue College Baseball Camps give an ideal combination of coaching quality and economic savings. Please take time to look through our offerings below and feel free to call if you have any questions. Traditional Junior and Senior Camps – geared towards the intermediate (has 1-2 years minimum experience in a league) to advanced (high level).Two sessions will be offered for 7-9 year-olds and 10-12 year-olds. Hitting, fielding, baserunning, team defense concepts, and pitching will be covered. Our summer camps emphasize four things: fun, lots of instruction, lots of prizes, and a great facility. Players receive numerous baseball memorabilia goods and have opportunities to win items such as bats, gloves, and pro baseball prizes. NEW for 2019: Skills Camp. Who is this camp for? *any 7 – 12 year-old who needs basic skill development, and doesn’t need the intimidation of higher-skilled players causing them to want to quit playing. *the player who either doesn’t have the confidence, desire to practice much on own, has no resources to improve skills on their own. *for the player who doesn’t have experience and is trying to gauge interest level, or generate interest. Why add this new camp? *Last year, this camp was called “Beginner” Camp, which was a turn off to some. This camp is not just for players who are just starting out. In fact, the target audience/typical player in this camp will actually be experienced, but needs more focused time on basic skill development in a shorter camp session (3 hours vs. 6 hours). *to continue our never-ending progression of providing high-level instruction in our traditional Junior and Senior Camps. Due to the high number of returning campers in these camps, the level of play, and curriculum keeps increasing each summer in order to provide more to the players who return and want to be challenged, learn more, and thrive to their fullest! *to provide a more comfortable, shortened day environment to aid attention and most importantly, interest in the game. *to provide an option for the 6-year-old who is on the advanced side, but size-wise, should not be in the 7-9 year-old camp. *for the player who needs confidence and a non-intimidating learning environment to keep the game fun. Contact Head Coach Mark Yoshino at 425-564-2356 or mark.yoshino@bellevuecollege.edu for more information on curriculum/appropriate camp selection. LOCATION: Located on Courter Field. Both facilities are on north end of the campus. DRIVING INSTRUCTIONS: 3000 Landerholm Circle SE (head west off intersection of 148th Ave. SE and SE 30th). Facilities located via north entrance to campus. AGE DIVISIONS: Skills camp: 6 -12. Junior Camps ages 7-9, Senior Camps ages 10-12. The ages listed means the league age your player this spring for the 2018 spring/summer season. See the master schedule for breakdown of eligible ages for each offering. Call Head Coach Mark Yoshino if you have questions or specific requests. Junior and Senior Camps are our traditional Monday through Thursday from 9AM – 3PM. 3-Day Skills Camp Mon.-Fri. 9AM-12 NOON. See the detailed schedule below for dates. COST: Junior and Senior Camps $290. Early Bird (before June 15) for a second Junior or Senior Camp for same person is only $145. A second Junior or Senior Camp after June 15 still has a $100 discount of $190. June Skills Camp $185. Sibling discount only for the June Skills Camp of $30 for second child. Question: “What if I sign player up initially for one Junior/Senior Camp, but later on before June 15 I want to add another…do I still get discount? Answer: Yes. You would have to e-mail though to get that discount internally. Ideally, you have your summer planned and sign up simultaneously, although if not possible at early time, we can make it work. DISCOUNTS: Compared to last summer, a $45 increase in discount with early bird registration. This year, if you sign up for a second (i.e. August) Junior or Senior camp for the same person the discount is $145. The total cost if a player does both camps is less than the previous summer! The multi-camp option makes it one of the most cost-efficient camp in the entire Puget Sound region. This averages out to less than $8/hour. No other high-level sports camp is offered at such a great cost. Other discounts / scholarships may be available through your local Little League. We donate several full-camp scholarships to several Little Leagues and elementary school auctions. Due to the high volume of donations, we do not offer any other type of assistance. For the shorter Skills Camp only, we do offer a sibling discount of $30 off for the second child if two sign up for the Skills Camp. DOOR PRIZES: Various handouts such as shirts, lanyards, and / or gym sacks for all participants. Additional awards and prizes on the final day of camp including: wood bats, gloves, official game hats, apparel and more! ENROLLMENT: 55. All participants must pre-register via the website or phone-e-mail. You will receive a confirmation of your enrollment via e-mail. WHEN TO ARRIVE: 15-30 minutes early. Parent should accompany camper on first day if registered by phone in case waiver needs to be signed/payment needed. WHAT TO BRING: baseball pants/sweats (for sliding), hat, glove, bat, helmet (if available), catcher’s gear (if the player has gear and plays the position of catcher), lunch and beverage in enclosed hard cooler, A limited selection of helmets, bats and catcher’s gear is available for those who do not own them. Please label all personal equipment. Lost and found is held for one week only following camp. Items are then turned over to Campus Security. Call (425) 564-2356 for lost items. PERSONAL FILMING: Allowed and encouraged at all camps. LUNCH/FOOD/REFRESHMENTS: Bring lunch in a hard cooler. If you are a parent bringing a lunch or are taking a camper out, ask the coach the day of camp when lunch break will be. SUPERVISION/STAFF: Members of the college team will serve as assistant instructors to ensure a proper participant:instructor ratio of approximately 8:1. Parents and coaches are encouraged to watch, ask questions, and provide reflective commentary on instructor quality. We value this input and have used this to improve our quality of instruction. Observers must stay clear of the activity area in order to maintain a safe camp environment. Once camp terminates, there will be NO direct supervision of campers (although staff will be present at the facility). INSURANCE: All participants must have medical clearance and insurance to participate. Medical expenses for accidents and / or illnesses are not the responsibility of Bellevue College. or via land mail. check to Bellevue College Baseball. Mail to same. 3000 Landerholm Circle SE G-100, Bellevue, WA 98007. Due to college policy we can no longer take credit card over the phone. *if you register on the day of camp, be prepared to sign a waiver! See e-mail contact below. CANCELLATIONS-REFUNDS: Refunds granted less $30 administration fee for summer camps regardless of time of cancellation. No refunds for weather (unless campus is officially closed by college officials). Please plan ahead before signing up. No refunds for partial attendance. For refunds, see contacts below. WAITING LIST: For each camp that is full, a waiting list will be established. Generally, one or two get into each camp in which a wait list is established. *note: if school district snow days prevent full attendance, tuition is pro-rated accordingly, so no worries – you will get refunded for any snow day make up! *the curriculum is tailored to skill level in each camp and number of returning campers from an earlier session. Example: In Junior Camp II, if there are a high number of returning players who were in session I earlier in the summer, the curriculum will be altered to accommodate repeat campers. 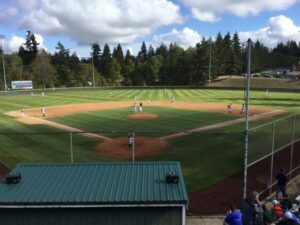 Home of the BC baseball team, Courter Field is one of the Pacific Northwest’s top baseball facilities.